David Afsharirad has revealed the table of contents for his next collection of The Year’s Best Military and Adventure SF, picked from short fiction published in 2015. 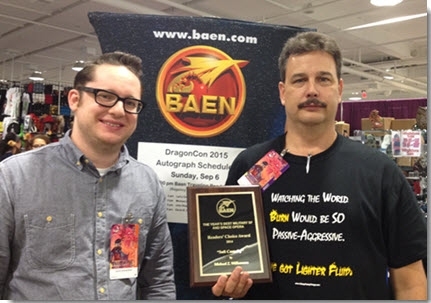 Baen once again will host a readers’ poll for best story from the collection. The official name now is The Year’s Best Military and Adventure SF Readers’ Choice Award. The voting site is not yet live, but will be by the time the book is released. Like last year, winner will be announced at DragonCon. Update 03/09/2016: Corrected title, added art and preorder links. This entry was posted in Awards and tagged David Afsharirad, The Year's Best Military and Adventure SF Readers' Choice Award by Mike Glyer. Bookmark the permalink. “The Wizard of the Trees” by Joe R. Lansdale is from Old Venus. “Remembery Day” by Sarah Pinsker is from Apex Magazine. “For the Love of Sylvia City” by Andrea M. Pawley is from Clarkesworld. You seem to think I went to the trouble of thinking up this story, emailing the editor to get the info, and writing the post simply because you’re running out of clay pigeons to blast. Knock it off. Mike Glyer: You seem to think I went to the trouble of thinking up this story, emailing the editor to get the info, and writing the post simply because you’re running out of clay pigeons to blast. No, I don’t think that — and assuming that I did think that is a really wild stretch of the imagination. I’ll make you a deal: you don’t make wild claims about what I must be thinking, and I won’t make wild claims about what you must be thinking. Thanks for posting the original publications with the TOC. Yay! It’s nice to see that they didn’t make it an in-house-only anthology this year. The Galaxy’s Edge stories can be read here. JJ: It’s nice to see that they didn’t make it an in-house-only anthology this year. It wasn’t that last year, either, as you would find by doing any research — http://www.isfdb.org/cgi-bin/pl.cgi?513884. Mike, take the deal but extract a concession – he doesn’t get to make any more wild claims about what I must be thinking either. Brian Z: Mike, take the deal but extract a concession – he doesn’t get to make any more wild claims about what I must be thinking either. I never need to make any wild claims about what you’re thinking — you’re always posting enough wild claims to use up the wild claim allotment for the entire contingent of Filers. I don’t know what JJ would do without me! Brian Z.: I don’t know what JJ would do without me. That’s just one more in a long list of things which you don’t know and which aren’t your concern, isn’t it? Thanks for correcting my erroneous impressions of this anthology series, Mike. I think it’s great that the editor has read and pulled from a wide variety of genre sources. JJ, you are a veritable master class, but I wouldn’t keep talking to you if I didn’t think there was a good chance of redemption. When you drop the vitriol and just have a conversation, it can be a lot of fun! I too had the impression that it was Baen only anthology last year. Baen is the driving force behind the anthology, and the winner is voted in a poll run by Baen, so the influence of Baen is significant. But no, the anthologies don’t contain Baen stories only. It’s nice to see that you’re still optimistic about the possibility of your redemption. Sadly, I accepted long ago that there’s no chance you’re ever going to see the light and make a positive change. Looking forward to seeing some excellent Military & Adventure SF. Of the 4 I’ve read, I think my vote might be for “Morrigan in Shadow”, possibly followed by “The Tumbledowns of Cleopatra Abyss”, although that isn’t very MilSF to my mind. @Mark-kitteh: “Tumbledowns” isn’t MilSF and it didn’t fit into the parameters of “Old Venus” either! I guess it’s adventure? @Camestros: Yep, same eye-bleedingly terrible cluttered design. In fairness to all the other MilSF and adventure stories out there, fans won’t crown the best MilSF story; what’s going to be crowned is the best story from this anthology. Yeah, maybe too nit picky, but this bugged me last year, too, IIRC. Interesting that they switched Space Opera to Adventure this time around. P.S. I’d love a “subscribe to comments EXCEPT from these people” option. Come on, WordPress. I suspect I’m not the only one. Hey Baen covers are great. One of the easiest publishers to know with a glance at the cover. Branding works. I’d comment on the snark but I’m not up to being involved in the conversation. @Soon Lee: Baen is the driving force behind the anthology, and the winner is voted in a poll run by Baen, so the influence of Baen is significant. But no, the anthologies don’t contain Baen stories only. I do find the methodology as posted a bit weighted. This is the kind of award I think the puppy leaders should be talking up to help it become prestigious. No, I’m not buying. Fans WILL crown the best MilSF story, in exactly the same way every other popularly voted award elevates a winner, regardless that some voters (or people who didn’t vote at all) will have preferred something else. I really love MilSF, but I’m not super excited about this collection for some reason (that has nothing to do with the Ow! My eyes! Baen cover, which I kind of like, even though I think it’s a mess). The stories in it that I’ve read haven’t worked for me in a way that makes me not look forward to the ones I haven’t read. Which doesn’t make as much sense as I’d like, but it’s been a long day. It’s effectively an award with a juried shortlist followed by a popular vote; you just have to judge the results on whether you think that was a good way of getting to a winner. I can think of worse ways. The title of the award (The Year’s Best Military and Adventure SF Readers’ Choice Award) makes it clear where it’s coming from, although if I was them I’d shorten it a bit! Tumbledowns certainly counts as adventure, and is also a good story with a nice retro feel to it. @Mark: Good description, and yeah, their title is super-long. 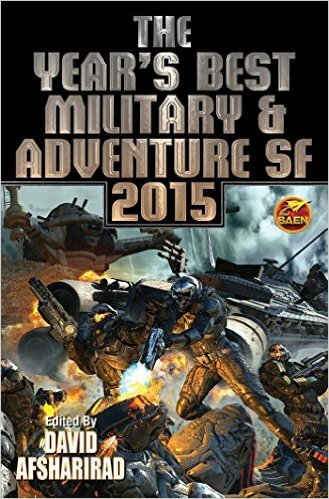 Apologies to Baen, I’m an idiot and didn’t read the fine print, so I thought Mike’s use of “Best Military SF Story of 2015” came from them and wasn’t just a creative headline. But Baen’s title is clear, especially if one knows the title of the anthology (which I do).